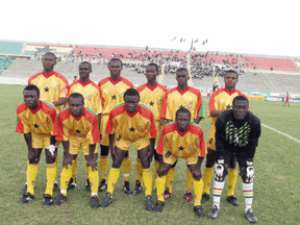 Accra, Dec 7, GNA-The national U-20 soccer team, Black Satellites who failed to qualify for the Africa Youth Championship (AYC) slated for Benin early next year, are billed to play their Malian counterparts in an international friendly in Bamako on Sunday. The team was shown the exit by neighbouring Cote D'Ivoire on a 2-1 aggregate. The Ghana Football Association (GFA) has invited 18 players to converge at the Ohene Djan Sports Stadium (formerly Accra Sports Stadium) on Wednesday to be conveyed to the Ghanaman Soccer Centre of Excellence, Prampram for camping. Those who played against Cote D'Ivoire in the final eliminator dominate the invited players. The invited players were Patrick Antwi, Frank Andoh, Kwasi Bobie, Douglas Nkrumah, Iddi Yahaya, Bawa Mumunie, Anarfi Emmanuel, Michael Akuffo, Daniel Asamoah and Anthony Annan. The rest were skipper Michael Helegbe, Felix Baffoe, Prince Antwi, Prince Tagoe, Amponsah Isaac, iddi Yakini, Alex Asamoah and Dramani Aminu.